Many of us don't get the chance to choose to give a speech. And others are simply asked by managers to give a speech or a presentation. So their choice is, at best, limited. But no matter if you choose to give or are asked to give a speech, one thing is certain. You must have a reason for that speech. Because you should have a mission or a purpose. That is, you want to achieve something with your speech. That was certainly the case with Theresa May's Florence speech. The Prime Minister certainly was on a mission to Florence. So she had a purpose. And that was to kick-start the apparently stalled Brexit negotiations. Her objective was to get the talks going again by re-iterating earlier positions and offering new arrangements. Clear and purposeful, if not strong and stable! Much of this speech wasn't new. Because the Prime Minister's Brexit speech in January was equally comprehensive, although article 50 wasn't triggered then. 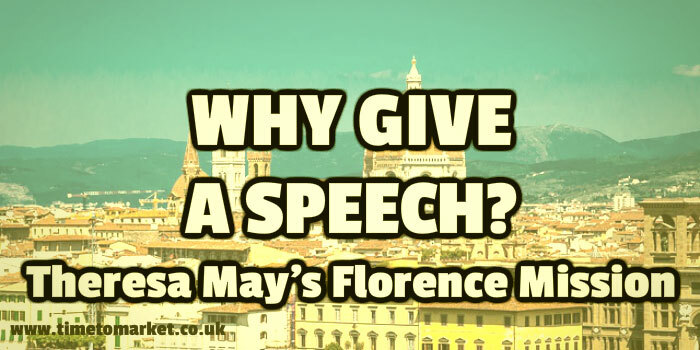 However, her Florence speech was rich in symbolism. She had a specially-invited audience and she had some serious purpose for being there. Britain has always – and will always – stand with its friends and allies in defence of these values. Our decision to leave the European Union is in no way a repudiation of this longstanding commitment. We may be leaving the European Union, but we are not leaving Europe. Across the Atlantic President Trump appeared equally purposeful at the United Nations where he gave a speech in which he roundly condemned the hostile actions of North Korea. Why Give A Speech At The UN? So why did the president choose to give a speech? It's probable that the actions of North Korea is the answer to that question. But, if you expected a tub-thumping, war-mongering speech then you are mistaken. It was more than that. Because this speech was well-constructed, well-rehearsed and well-given. Yes, one section of his speech received plenty of attention. But his speech covered much more. Because it proved to be wide-ranging as it examined the purpose of the United Nations, the roles played by all sovereign countries and, of course, America. His purpose was evident. This is the true vision of the United Nations, the ancient wish of every people, and the deepest yearning that lives inside every sacred soul. So let this be our mission, and let this be our message to the world: We will fight together, sacrifice together, and stand together for peace, for freedom, for justice, for family, for humanity, and for the almighty God who made us all. Both speakers chose to give a speech to meet their own requirements. So they had a purpose and they had a mission. And they definitely brought the energy and imagination to their speeches. The atmosphere of the United Nations is certainly conducive to geo-strategy speeches, so the President made good use of that. And the Prime Minister? She certainly had good reason to give a speech. Politically and diplomatically she has to get Brexit to work. She had both mission and purpose. And the visual imagery and symbolism of Florence certainly proved useful. When you too need purpose in your speeches, don't forget that you can develop your public speaking skills with training courses and public speaking coaching. Please don't hesitate to get in touch when the time is right.